December 7th from 4:00-7:00pm at the Santa Rosa Junior College Cafeteria on the Santa Rosa campus. 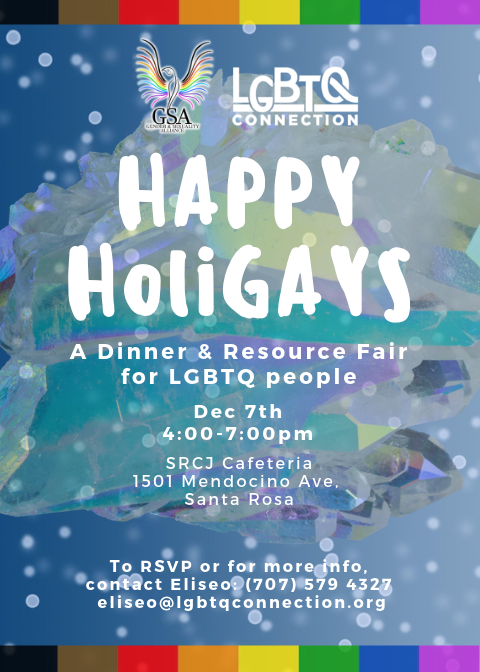 With the support of the SRJC's Gender and Sexualities Alliance club, LGBTQ Connection's Youth Leadership Team invites you to a night of holiday cheer, free food, & great resources. If you can, please bring an appetizer or side that you want to share with others. It starts with connection! RSVP is encouraged but not required. Contact Eliseo at eliseo@lgbtqconnection.org or 707-579-4327.